The most important factors that makes the very existence of mankind on earth possible and enchanting, are the life forms surrounding us. We share this planet with numerous plants and animals but we seldom find time to cherish the beauty of them. Everyone must at some time, take a break from what they do for a living and live with nature, with all her wonderful creatures. I would like to share some of my experiences, photographs of creatures of such beauty and elegance that we find around us. According to me, it is not necessary for people to take a long and expensive vacation to get a taste of this world. Instead, these can be observed around us, next to where we live… at our native village.. at our workplace etc. Hence please do read and express your opinions and share your experiences with me. How many of you would agree with my opinion that, of all the creatures, reptiles (lizards, snakes, etc,.) and insects are highly detested and most of the times, killed for no apparent reason by humans. We are not aware of the chaos that will follow as a result of uncontrolled destruction of these life forms. Lower life forms such as insects,reptiles and amphibians (eg :frogs, toads,.etc) form the very foundation of nature’s food chain and as a matter of fact, they are the core of life’s existence on earth. 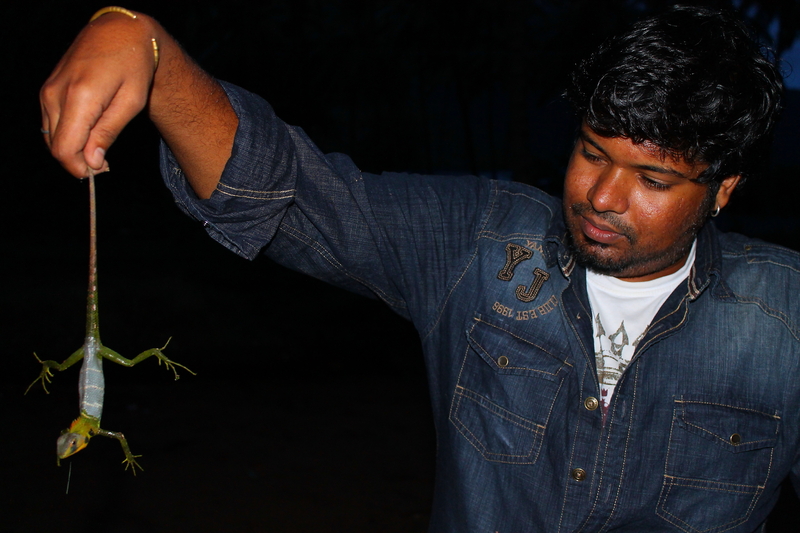 These creatures such as snakes, lizards etc,. are not vicious killers as they are pictured or feared to be. But on the other way, they help us by keeping in check the population of pests. 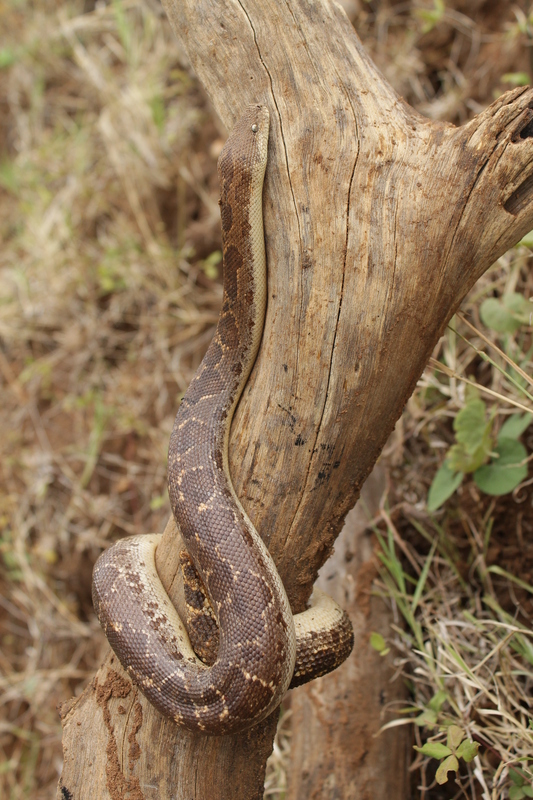 Here I write about one such creature… the SAND BOA. These snakes are found in India, Pakistan, Sri Lanka and in parts of African continents. - Photo by Nithilan Paul. This particular snake in absolutely non-poisonous and harmless. It lives on small animals like rats, mice, moles, lizards, frogs and insects. It constricts the prey and swallows the prey. This snake helps in controlling rat population and other pests, hence a friend of farmers. But the sad part is that these snakes are often mistaken as poisonous and killed. These snakes also deserve the right to live and they must not be harmed. People who are ignorant about snakes must be educated about the role of snakes in the eco-system. So dear readers, whenever you come across snakes about to be harmed, please do act to conserve them and preserve the eco-system. Most of us are familiar with garden lizards. Unlike the ones that we find on our walls, these creatures live mostly in the trees. They eat up insects such as grass hoppers and worms that destroy crops thereby acting as natural pest controlling agents. These creatures are well adapted to different environments and they vary accordingly. 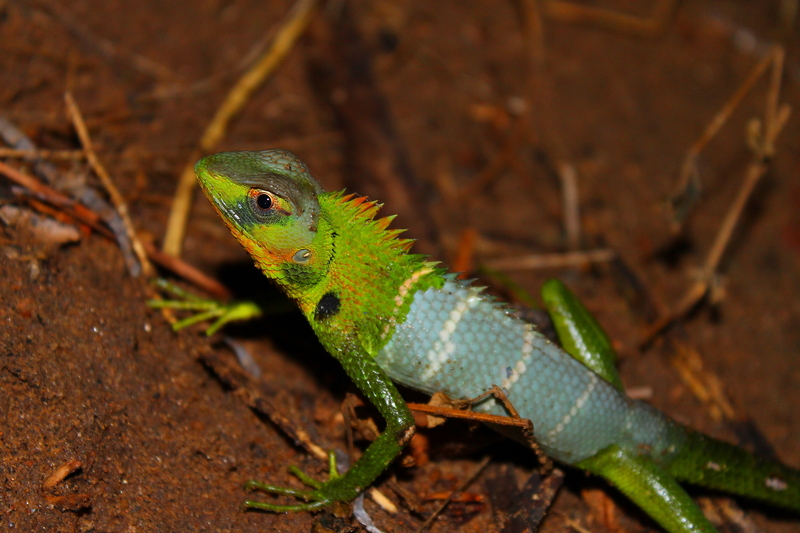 Below is the photograph of a Green Forest Lizard, found at a farm. These lizards are completely harmless. They are non-poisonous and they can never harm a human being. It is observed that they may display a threatening stance when they are cornered which is only for self-defense, but generally they avoid human contact. In the below photograph, a Green forest lizard, found in a warehouse being safely returned to the wild. Yet another species, commonly found in the forests and surrounding areas is the Rock Agama. These are similar to the Green forest lizard but for a slight difference in thier habitat. These creatures live in bushes, scrub forests and on rocks. They can tolerate high temperatures and though they have some threatening tatoos on them, they never harm humans!!! 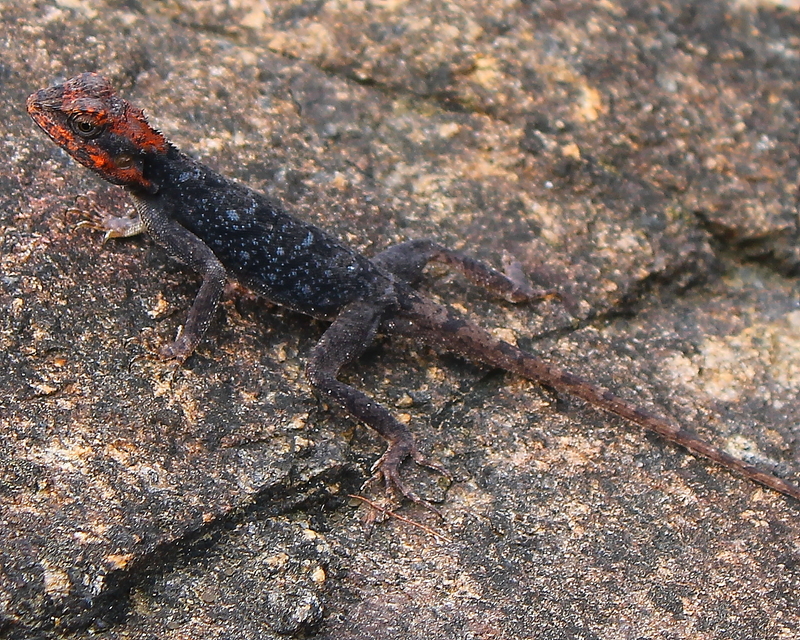 A male Rock Agama, devouring a beetle, found on the outskirts of forest in South India. These creatures does not need human intervention for their survival, but only their absence. By conserving their habitat i.e,. trees and scrubs, these life forms can be protected. Sometimes folks, it is good to stop by and look at a beautifully coloured reptile perched on a stone where we go for a walk. The more we observe them, the less we detest or ignore them. This simple attitude helps a lot in the conservation of these species. The above photograph was at a pond nearby. How many of us have ever noticed these little creatures found on lakes and ponds, skating on the water? 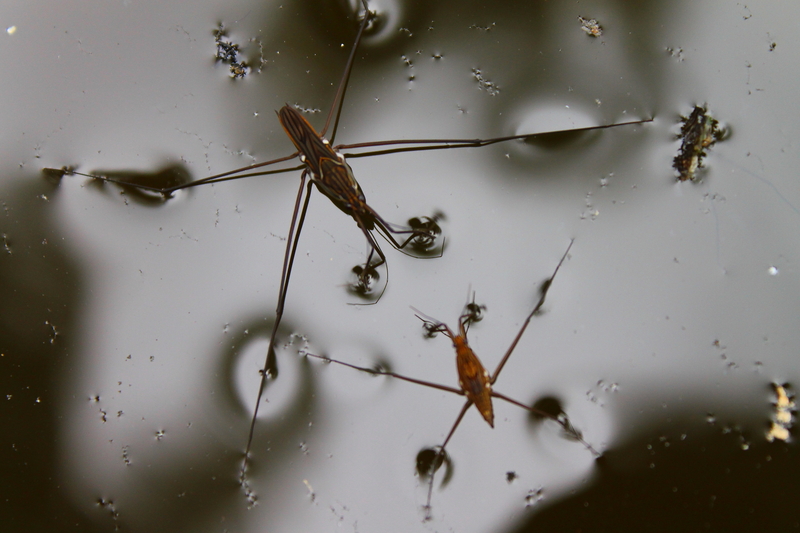 These insects use their long legs upto twice their size to move and navigate on water surface. They use the high surface tension of water to literally walk on them!! Surprisingly, these are predators that kill and eat small insects that fall on water like fly, bees, etc, But friends, they are harmless to humans and they certainly help in balancing the Eco-system and of course, Pest control. hey there people I would like to share a trip report about Wildospher its a adventure tour organizer. I went with these guys and what an experience these guys actually showed me kaziranga Tiger in some remote area of the forest I must say they know the forest pretty well beautiful birds all around they took me so close that I can click my pictures from any angle same with the rhinos aswell Wildospher is the best I recommend u people to go with them they even do the untouched forest neora national park I been with them even there they made me do a foot safari and i saw marble cat clouded leopard and leopard while I was on a foot safari these guys are blessed I must say. the experience and the hospitality is just great, there are many more things that they offer for a adventure outdoors rafting is again one of there specialty. contact then on there mail sunny.globeib@gmail.com or facebook page www.facebook.com/wildospher .get in touch with them for some stunning experience for adventure. The Baroli Temples Complex, also known as the Badoli temples, is located in Baroli village in Rawatbhata taluk in Kota district in Rajasthan, India.They are built in the Pratihara style of temple architecture dated to the tenth century A.D.
Parajhar is a nearby waterfall. The underground water flowing in caves has carved statues and figures on the stones in the cave. Many people have died due to accidents near the waterfall. It is near to village called Parajhar gaon. This place is also known for historic cave-temple of Lord Shiv. During Mahashivratri a large festival is organised here. water-fall and green surrounding is the attraction for peoples. In the way we also saw Vulture birds .